What a moment the NI food scene is enjoying at present. When we visited a couple of weeks ago for the BBC GoodFood Show we could not get over the air of positivity and buzz about the place. Thousands of foodies travelled far and wide to catch a glimpse of celebrity chefs such as Paul Rankin, The Hairy Bikers and of course the star of the show James Martin of “Saturday Kitchen” fame who caused quite the stir with his sell out demo to over 2,300. The celebs however were only part of the draw, it was the passionate producers from all over Northern Ireland that really bowled us over with the range of food and drinks on display from Genisis Crafty baked treats, Broughgammon rose Veal sausages to some gintastic samples from Shortcross Gin. After spending the afternoon at The Waterfront and filling up on our fair share of tasty treats we decide to walk it off by dropping off our bags to our home of the night, which just happened to be one of the most stunning buildings in the entire city – The Merchant Hotel. Housed in the Cathedral Quarter; the hotel, which was once a bank, now a listed building, is a breathtaking example of how a period building can be brought up to date without compromising any of its history. It has an enviable location which is surrounded by the city’s best bars and restaurants, however this is one hotel you may find hard to leave, as we discovered. Rooms are separated into to themes of Victorian Splendour or Deco Decadence, the latter was where we would lay our heads for the night. As you walk through the corridors each turn reveals something unique, with art deco photography and Charlestoesque ladies adorning each door. Everything about the design oozes luxury in a very grown up way and could not be any further from what once housed a bunch of very sober accountants. Our room on the fifth floor with floor-to-ceiling windows and enviable views of the city below is one that will be very hard to forget. Twin king size beds,with crushed velvet soft furnishings should your evening not go as well as planned, dominate the room. On the opposite side are modern art deco chairs with all the mods cons of flat screen TV’s complete with Netflix and a fine selection of herbal teas. Tucked inside the walk in wardrobe is a vanity mirror with lights and plush, suede walls, in truth one of us would gladly have slept in here it was that beautiful. The mark of any good hotel stay is the shower, the bathroom was one of the most striking we have ever come across. Frosted glass with the same decadent artwork that dons the walls was etched onto the door, beckoning you inside to reveal a sumptuous Victorian style bath and massive rain shower with marble seating, feature mirror and heated tiles. Every detail in the rooms are five star and the standard of maintenance is impeccable. If you have yet to visit The Great Room in The Merchant you need to pop it on your bucket list as it is one of the most exquisite dining rooms in the land. We had booked dinner there after spending the evening relaxing in the rooftop hot tub overlooking the the iconic Albert Memorial Clock. As dining rooms go when you step into the Great Room you feel as though you have just walked onto the set of The Great Gatsby. Hard to imagine this was once a banking hall with its gilded ceilings, ornate cherubs and Ireland’s largest chandelier with over 2,600 pieces of Tyrone crystal. Everything in the room is pure opulence, a recurrent theme throughout the entire hotel. The menu is not the usual hotel fare, here award winning Head chef John Paul Leake has created a menu that is both exciting and constantly evolving with the seasons. With over 28 staff this is a seriously busy kitchen and as Northern Ireland’s only AA 5 Red Star hotel the need for consistency is key. We dined from the set Sunday menu of 2 courses for £25.50 or 3 for £29.60 which has a choice of five starters and five mains that covers most bases. 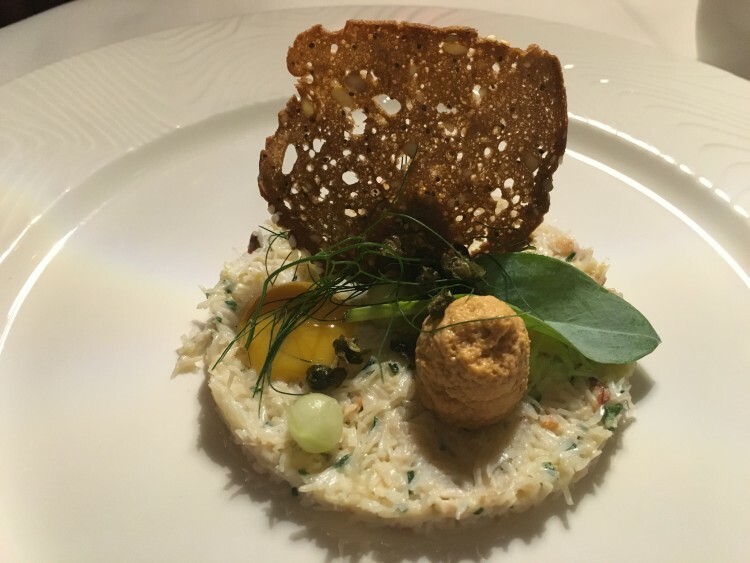 Kilkeel Crab is in our opinion one of the finest on our shores so we began with an exquisitely creamy white crab patty, topped with brown crab mousse, cucumber spheres and a crunchy pumpernickel melba that added a contrasting texture to the soft crab. 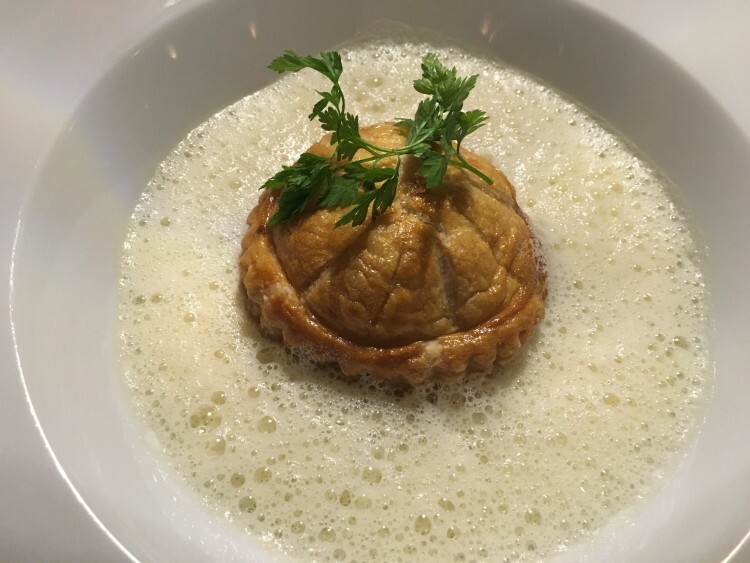 Across the table a sea of Jerusalem artichoke foam engulfed a perfectly formed Game Pithivier so fresh we were informed it may contain shot. Packed with venison, mallard, partridge and hints of pancetta this moorish little starter was one we were more than happy to bite the bullet for. John Dory is a popular fish you often see at this time of the year on many restaurant menus, The Merchant put their own stamp on it on this sweet, delicate morsel by pairing it with one some on trend pumpkin and purple sprouting broccoli. 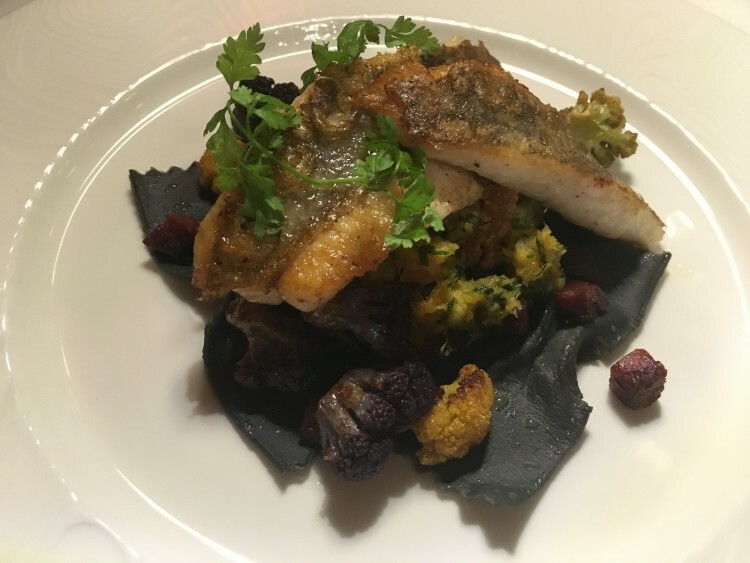 Black farfelle pasta, tiny bow ties, inky black acted as the ideal cradle for the two generous portions of this pan fried fish. The Duck was proving to be a popular dish in the room and with sneaking look at our neighbours we could see why. Six plump slices of pink breast sat proudly on the plate oozing juice and drizzled in a spiced plum jus. 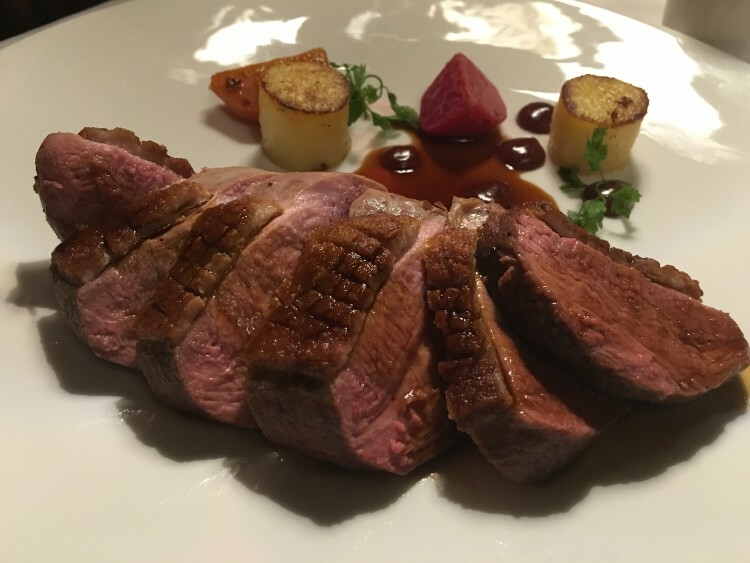 It was a controlled plate and an example of a chef confident in his own ability, resisting the urge to overcompensate and instead only needing to add one or two subtle roast beets and some buttery potato fondants to execute a great plate of food. After two superb courses we had a momentary case of “the fear” and almost resisted the urge to order dessert as so often a disappointing dessert can leave more than a bad after taste. 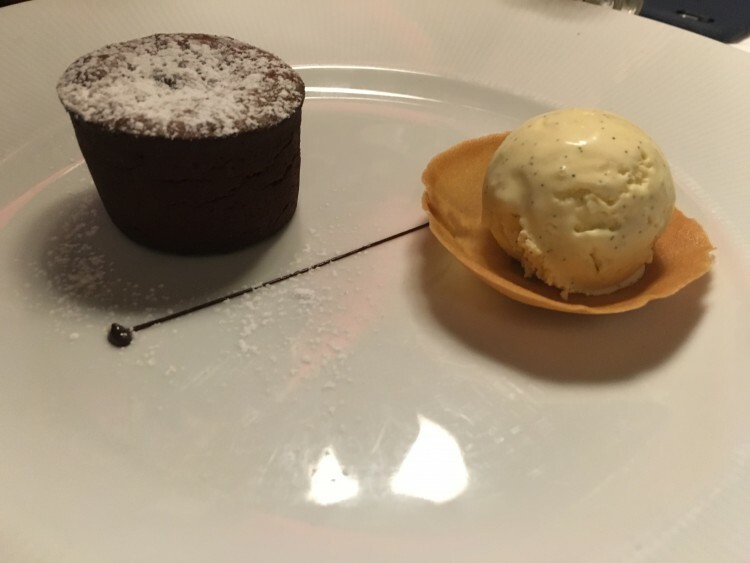 Thankfully our Valrhona Chocolate Fondant contained the mother load of gooey deliciousment. 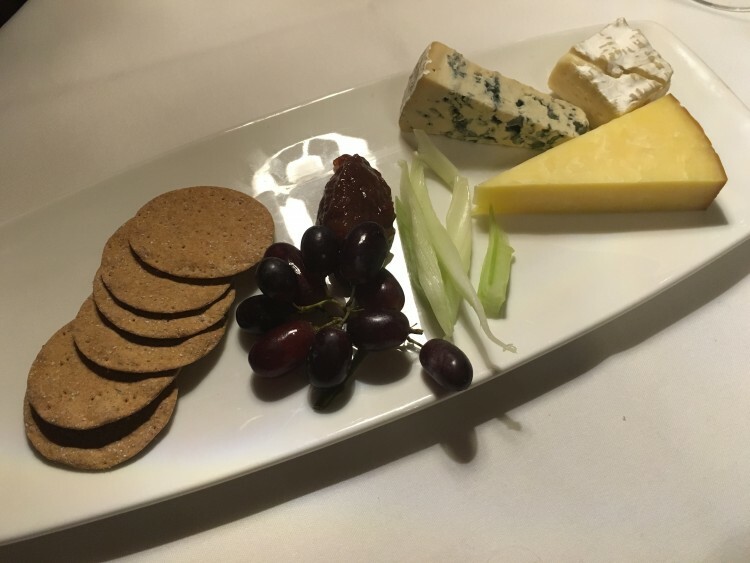 On our waitress Gabriella’s suggested we also sampled a small melt in the mouth Cheese Board with rye crackers and a sweet onion chutney. Paired with a Shiraz from one our favourite Australian estates, an earthy De Bertoli, Vat 8 and sitting in such a stunning setting it is hard not to romanticise just how much we enjoyed the experience. We finished our evening with a nightcap in The Merchant’s iconic and award winning New York inspired, Bert’s Jazz Bar where we enjoyed an aptly named Tobermory Scotch “Penicillin” whiskey cocktail and a Hendrick’s Gin “Playwright” while savouring the smooth live jazz before heading up for one of the best night sleeps in a long time. 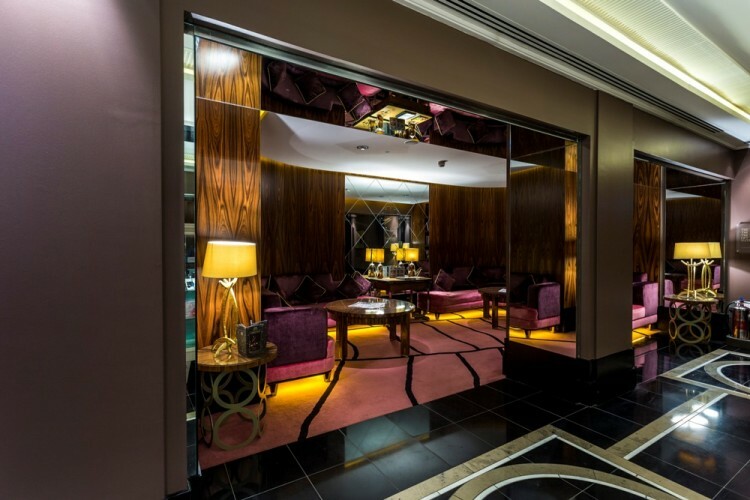 The Merchant has etched a special place in our heart, for a city centre hotel it has embodied all the qualities of what a luxury escape should be, decadent, faultless and hard to leave.